You are here: Home / Podcasts / Episode 68: Should I Jump? Episode 68: Should I Jump? You have a job and it’s paying the bills. Maybe it’s even more than paying the bills, you are making really good money! Your family is taken care of, you have good healthcare, all of your kids needs are taken care of, and you have money left over to invest. You can even go out on a couple date nights a month! Life is good! Except… you know this isn’t the job for you. You know you’re done with it. You will never achieve your life goals in this job. And then it happens, you see what may be THE OPPORTUNITY to make THE LEAP! But should you? 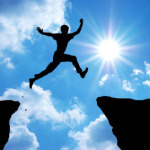 This week, over a terrible phone connection, Brecht and Scott field a listener question about whether, and how, to make the leap. We both come at this from different angles, but at the end, we offer up something of a framework (very casual of course) to work through this issue.